I first met guitarist Sheryl Bailey in 1994 at Twins, a restaurant in Washington, D.C., founded in 1986 by jazz- loving Ethiopian twin sisters Kelly and Maze Tesfaye. This was when the restaurant was still on Colorado Avenue, a block east of 16th Street. A few years later the club moved downtown to a U Street location and has for more than a decade thrived as a major venue, serving Ethiopian and Caribbean cuisine and featuring a wide spectrum of jazz styles. The occasion of our 1994 meeting was a gig of saxophonist Leigh Pilzer’s She Bop combo. My then twelve-year-old son Neale was with me. Apparently one of the musicians pointed me out to Sheryl and she came over to my table and handed me a copy of her first CD, Little Misunderstood, saying, “This is for you.” I had been hearing of her from D.C. drummer the late Louie Bellucci, who told me that he had caught a young Baltimore guitarist at the One Step Down and was very impressed. Her contributions to the evening’s program that Neale and I caught in 1994 verified Louie’s very positive assessment. 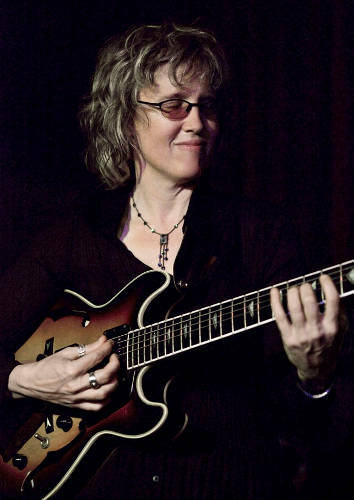 In the decade-and-a-half since, Sheryl Bailey has proved to be a major guitar voice in jazz (and other genres), taking third place in the 1995 Thelonious Monk Guitar Competition (she was the competition’s first female instrumentalist finalist) and releasing six CDs and a DVD under her own name. In addition to her active performance schedule, Sheryl has for the past decade been an associate professor of guitar at Boston’s Berklee College of Music, from which she had graduated. She has been a clinician and artist in residence at a number of other institutions and has authored two guitar instruction books. She crosses musical boundaries, working in jazz, blues, rock, Afro-pop, klezmer, hip-hop, and pop and has toured here and abroad with Richard Bona, Klezmer Madness, Jazz Guitars Play Jimi Hendrix, Jack Wilkins, and her own combos. Sheryl’s most recent CD, A New Promise (Manchester Craftsmen’s Guild), has her leading a 16-member band, the Three Rivers Orchestra. The album’s title tune, penned by Cheryl, is in memory of guitarist Emily Remler, who died in 1990 at the age of thirty-two. Three of Remler’s compositions are included on the CD. The label’s publicity release has Sheryl giving expression to the impact that Remler had on her. Detailed information about Sheryl Bailey can be found at www.sherylbailey.com and www.myspace.com/sherylbailey3. I audio and video taped an interview with Sheryl in my former home in Silver Spring, Maryland, on February 26, 2005. I began by asking her to tell me where and when she was born and about her family background. “I don’t know. I mean, I always thought it was what everybody did. We grew up in a rural area and there wasn’t a lot of culture there so I just assumed that everybody played. We would sing show tunes and all my sisters were always involved with musicals, musical theatre. My mother would also play. There’s a picture of me when I’m very small, it was in the local paper. I would just get up on the piano and improvise, just play sounds for hours, story sounds, you know, like children will do. Anyhow I guess I’d been at a women’s club meeting with my mother and got bored and got on the piano and just started off one of my fantasies, and so at a very young age I was playing keyboard, and interested in being creative with music. I was probably about three. I didn’t take lessons until later, but at that point it was just story telling for me, I would spend hours just getting lost in my fantasy world of sounds. “My grandmother is Dr. Sally Tobin Dietrich and she passed away not too long ago. She lived into her nineties. My mother, Sally Bailey, recently had a stroke, so she can’t play the piano anymore. Sally is my oldest sister, eleven years older. Susie is just under her, and played great, still plays a little bit, and my brother John. I’m the youngest. So I grew up with this music around. My brother is a cartoonist now, Susie is a graphic artist, and Sally is a drama therapist. She runs the drama therapy department at Kansas State University, Manhattan, Kansas. So we’re all involved in the arts, and that’s just what I thought you do. And it wasn’t even that this was a career, it was what you do. I thought when I was a little girl, what am I going to do when I grow up and I would say, an artist or a great poet. I thought that’s the kind of stuff you did. I didn’t think about, I’ll be a doctor and make lots of money, or whatever, it was just the natural happening. “ I don’t think I started piano lessons until I was in fifth grade, but in second grade — this is the weirdest thing I ever heard of — they gave us this sort of test, they were always giving aptitude tests back then, in the ’70s. And the results came back, and they said that I couldn’t be in the band because I didn’t pass this test. I was devastated, I was angry, I was just, ‘What are you talking about?’ So I had to talk to the music teacher and, like, you know, ‘I can do this.’ So because of that I actually was always a first chair, I took up the trumpet. I was so determined at five, I was, like, how dare you tell me I’m not gonna play music? It was actually a challenge to me, to show them. You weren’t gonna let me in the band, and then you let me in the band, I’m gonna be the first chair. So that gave me the drive to be that. I took a lot of pride in that throughout school. It was just standard band music. I would practice that stuff and then I would learn stuff from records, too, melodies and things. We had Herb Alpert records. So I spent a lot of time just playing the trumpet, outside of what you had to do for band. “I would try to learn songs and play all the high melodies. I was doing it all by ear. I knew how to read music, better then than I can now. I played trumpet all the way up into high school. My interest in it dropped off when I started playing guitar. So I really got into guitar and then I just kind of kept my trumpet playing together to stay in the band. To be honest, I wasn’t the best piano student because the things I liked to practice were the minor key stuff, you know, Russian composers and stuff. I wasn’t a great student. I’m sure my piano teachers were shocked. I can’t remember my piano teacher. My band teacher, when I said I’ll prove to you that I can be that, was Frank Zimmaro, and he was a great influence to me as a kid, and he was in the music program at my school up until the time I graduated high school. He was always a very positive force, and was always very supportive of me. By the end of the 1970s, when she was entering her teens, Sheryl had been listening to rock music for three years or so. “I used to hang out with my brother John,” Sheryl continued. “We lived on a farm, so me and my brother were very close, we would hang out with friends, listen to all the rock bands. Deep Purple, Humble Pie, the Beatles, all those bands. Uriah Heep and all those kind of hard-rock bands, and so I thought John was the coolest guy. I loved this guitarist Peter Frampton, ’cause at the time he had this record Frampton Comes Alive, and back then on the rock records, the bands would improvise. One side of an album was a song — they don’t do that anymore. He was into this thing called the talk box and he would make his guitar talk, and I just loved that, I would listen to that, and it was my favorite record, and I thought that would be my dream, to be a guitarist like that. I don’t even know how it works. I would love to get one. You sing through it and it’s connected to the pickups of the guitar, so you can actually do vowel sounds to the notes that you play. It sort of shapes the notes as they come out. So you can actually sort of sing and it’s a voice that’s coming through the guitar, it’s really cool. “So then I kind of followed up and got into other bands. I guess by the time I got my guitar, I was into all that music and Cream, which is Eric Clapton’s group. And, really, all these bands are blues guitar, they were copies of blues guitarists. So, really, what I was absorbing was Jimmy Hendricks, blues guitar, the history of blues guitar. That’s really what that language is of that style of playing, blues guitar. “That’s the stuff we liked to listen to. And my brother was in a way sort of pivotal in getting me into jazz. He was sixteen or seventeen, and all of a sudden he came home one day and said, ‘I’m into fusion now.” And I was, like, ‘That sounds so cool! I have to get into that too.’ His fusion was a Stanley Clarke record, School Days and Al Di Meola’s Electric Rendezvous and “Just the Two of Us” [a song on the 1981 album Winelight] by Grover Washington Jr. He was into Frank Zappa, too. So he would go out and I’d sneak into his room and listen to his fusion records, and that got me curious about jazz. “A kid up the street showed me how to play the basics. It’s a boogie woogie pattern, same old one from way back, but all rock songs use that basic pattern. So, as soon as I figured it out, I thought, ‘Oh, I can figure out all my favorite songs,’ and none of them were that harmonically complex, they always use that type of rhythm. So once he showed me how to do that, I remember just playing it for more than six hours one day, my hands hurt, I just had to break, open up my hand. But once I figured that out, yeah, I just taught myself everything. I remember reading in a book, too, or some guitar player magazine, about how you put a rock on top of your records to slow the turntable down and get stuff. So I would burn out the belt on the turntable! So I learned these little things that I needed to do. “How did they respond to a girl playing? “No, ’cause I was the best player,” she says, laughing. “It was kind of a shock, for sure,” she says, laughing. “Well, when I came to Baltimore I just went out and started booking my own gigs and also to just meet the players there. Eventually I met [pianist] George Colligan and [trumpeter] Alex Norris and I just kind of made things happen for myself so people could get to know me and I get to know them. Then I just started freelancing as well as doing gigs booked under my name as a leader. It’s funny, I kind of just went to work. I started teaching at Towson University in maybe ’92. I used to play in the house band at the Haven and I played a lot there over the years. It’s a little dive, but it’s still going, it’s like the jazz club [in Baltimore]. There were other places that would open up and close down. I started working with this drummer, Larry Bright, who was, like, a fusion drummer, and [bassist] Gary Grainger. We would do drum festivals and drum clinics and stuff. It was just this all out, just this crazy power trio. And in a way this is sort of me coming full circle into my rock playing, fusing that with the jazz playing. A lot of the players were really curious about how I played, ’cause I didn’t approach it like a rock player, per se, but I had technique from playing that kind of music. Really, I was approaching everything from a bebop perspective, playing over that kind of music. So a lot of the players were really curious about how I was playing, what I was playing. I was playing Bird, but with electric guitar, with distortion, or digital delay, wawa pedal, whatever, to make that sort of guitar sound, but the phrasing and content of my lines are all coming out of bebop. So people were curious about what I was doing. ‘Just get an Omni book! [I.e., Charlie Parker Omnibook: For C Instruments (Treble Clef)] It’s all in there!’” she says she told them, laughing. “All of them, at this point. I’m working with David Krakauer’s Klezmer Madness and we’ve done all of the major festivals. W. Royal Stokes was editor of Jazz Notes, the quarterly journal of the Jazz Journalists Association, from 1992 to 2001 and has been editor of JazzTimes and the Washington Post’s jazz critic. He is the author of The Jazz Scene: An Informal History from New Orleans to 1990 (Oxford University Press, 1991), Swing Era New York: The Jazz Photographs of Charles Peterson (Temple University Press, 1994), Living the Jazz Life: Conversations with Forty Musicians about Their Careers in Jazz (Oxford University Press, 2000), and Growing Up With Jazz: Twenty-Four Musicians Talk About Their Lives and Careers (Oxford University Press, 2005). His novel Backwards Over will see publication in 2010. He is currently at work on a memoir and a fourth collection of jazz and blues profiles.